Urban Archeologist: Got a Match? .... Don't answer that! I don't want to spend too much time reflecting on the contents of someone's basement, but if you have one, or your parents had one, well, maybe you'll understand. I was always fascinated by the odd things my parents kept down there. What was it all, and where did it come from? This intrigued me growing up, and I often snooped through my parents basement storage trying to uncover the past. I liked the treasure hunt and the detective work. What would I find? A friend, though possibly better described as an "enabler", permitted me to venture through the basement of a home he and his wife were clearing out as a favor to a family. The owners had either passed away, or been moved to a hospice and had left behind a lifetime of "stuff". The family had taken everything of value to them, and my friends offered to toss and tidy the rest in preparation for a sale. I came with my partner; my 5-year old daughter. She has been my companion on many a "dig" and though sometimes easily bored and distracted, she usually is the one to come away with a pile of treasure. This time we both scored. Her pile consisted of a few utensils and decorations for her play kitchen, and me, an old wooden tool box filled with odds and ends. 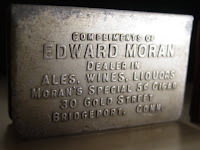 One of the items was a match box cover/protector advertising a Bridgeport business; the age is unknown. The matchbox was still tucked inside it, though I didn't think to remove it from the cover until a few weeks later. It was a find within a find. 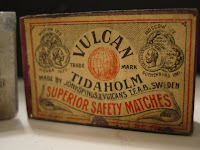 The box is made of wood, very delicate but the overall condition was very good and still workable, though no matches. I am still researching the age of this as well.